It can be a lot of fun hunting for used furniture at garage sales, consignment stores, and antique stores. You might even inherit a piece of furniture from a friend or relative. Old furniture can often be incredible pieces and bring a luxurious look to your home. More often than not, you can get great deals as well! But its like your mother always said, “You don’t know where that’s been”. You’ll want to clean and disinfect the new-old furniture before it takes a permanent place in your home. Don’t bring unwanted, decades-old germs and bacteria into your home. 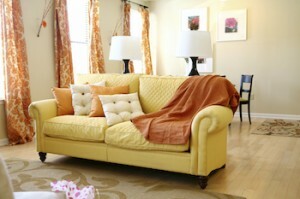 Make sure the furniture is in pristine cleanliness and is void of any unpleasant odors. First thing first, you will want to be sure that your furniture is properly disinfected. There are a number of ways to go about this. One way is to purchase sanitizing wipes, aerosol sprays, or create your own mixture of vinegar and warm water and scrub the furniture down. There’s no guarantee that these methods will clean deep enough to be worth it. Another way is to call in Van’s Chem-Dry who will use professional strength sanitizer to eliminate unhealthy bacteria. After you have sanitized and disinfected your furniture, you can begin removing any unwanted odors. Unfortunately, most fabric fresheners and deodorizers won’t get rid of musty smells or pet odors because the odors are caused by moisture that has been trapped in the fabric. Again, your best course of action is either the warm water and vinegar solution or the specialists at Chem-Dry. We take pride in eliminating unwanted odors, not just masking them. If you find a beautiful leather seat that is a little worn, remember that we specialize in that too. Read more about cleaning and restoring leather.